In February we blogged about our work to get GOV.UK ready for the third big group of users, specialist users. Specialists users are the users of GOV.UK whose needs are dictated by their specialist interest or profession. Examples might be a clinical scientist, a trade marks attorney or a childminder. Since then we have done more than 100 hours of user research with specialists. We’ve done phone interviews, office visits, remote card-sorts and testing prototypes both by screen-sharing and in labs. We’ve spoken to users who work in oil and gas, charities, competition law, schools, children’s services, intellectual property, waste management, the pharmaceutical and medical devices industries and healthcare. From all this user research we have developed some new navigation page templates and our information architects have been creating navigation to populate them. We’re referring internally to these new navigation templates as specialist topics and sub-topics. (Externally, we currently favour the label “sector” instead of “specialist”, but that may change as we continue to test it with users). Content in any format and published by any organisation will be able to be grouped together around specialist topics. These new pages will replace “detailed guide categories” and the existing topic pages. We will share designs that demonstrate how that will work shortly. The pages provide two levels of navigation and that’s enough for the majority of user needs. We’re working on other features for specific areas of content that require more complex navigation. 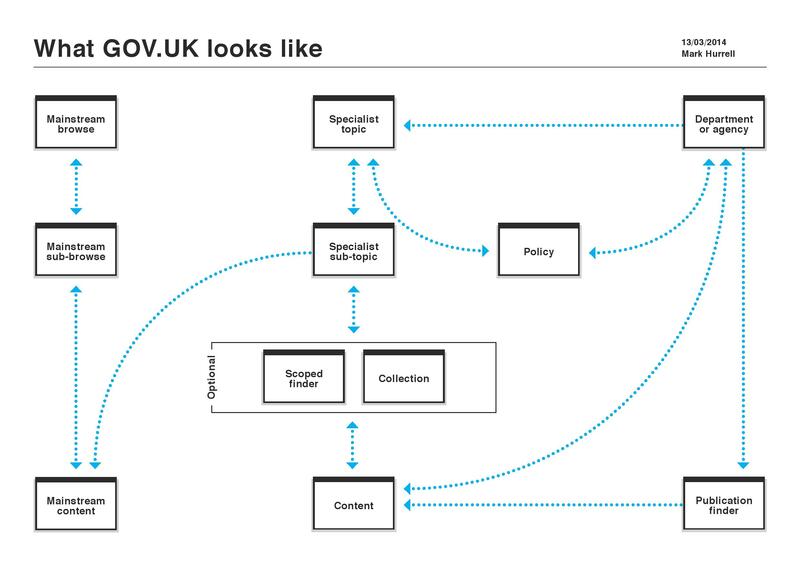 This diagram shows how the new specialist topics and sub-topics will fit with the existing mainstream browse pages and the departments and policies pages. Content appears on these pages when a tag is applied using the new field in the publisher called “Specialist sectors”. Once enough content has been tagged to the topics and the pages can be considered useful then we will link to the pages from the relevant organisation page. We’ve linked to the oil and gas page from the Department of Energy and Climate Change in the top tasks links. There is still lots of work to do on the topics pages. We’ve got a lot more topics to create to enable all the agencies and ALBs to migrate to GOV.UK. We’ll be evaluating how the pages perform as they are launched, using both analytics and more user research. We’ll share more about these developments in subsequent blog posts. We have something similar to your topic pages in buenosaires.gob.ar. One question arises for this type of cross-agency pages... Who is in charge of maintenance?